20% active ingredient Oleuropein (most products contain just 6%) A natural, yet effective, alternative to antibiotics with none of the side effects. 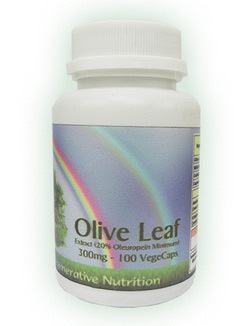 Olive Leaf is a great infection fighter with powerful healing properties. Safe & non-toxic. Research published by the American Society for Microbiology, found that Olive Leaf Extract inhibited the growth of every virus, bacteria, fungi and protozoa it was tested against. The anti-viral activity is due to the action of Oleuropein on the protein coat of a virus. The synergistic structure of anti-oxidant polyphenols, esters, flavonoids, and multiple iridoids work together to weaken disease causing organisms and interfere with the ability of a virus to assemble at the cell membrane. It acts to prevent the onset of colds, flu, a range of viruses, yeast & bacterial infections & parasites. Olive Leaf has high levels of antioxidants (more than green tea or vitamin c) and builds the immune system by stimulating phagocyte production which enables immune cells to destroy microbes. Scientific research has shown that the active ingredient in Olive Leaf Extract, Oleuropein, has powerful healing properties that fights the bacteria, viruses, fungi and parasites that cause infection and disease. The Olive Tree is often referred to as "The Tree of Life" and Olive Leaf Extract has been used as a natural antibiotic for thousands of years, it was revered by the Egyptians. Medical reports from 1855 detail the drinking of a tea brewed with olive leaves as being effective against Malaria. When the active components were isolated in 1969 by a major pharmaceutical firm - the Upjohn Company, an upsurge of research resulted in dramatic discoveries. Olive Leaf Extract can be effective where allopathic antibiotic treatment has failed. Olive Leaf Extract acts to prevent the onset of colds, flu, and a range of viruses, yeast, fungal and mould problems, bacterial infections, and parasites. It has even been found as an effective treatment and preventive for malaria. The anti-viral activity of Olive Leaf Extract is due to the action of Oleuropein on the protein coat of the virus. It is thought to inactivate micro-organisms by dissolving the outer lining of the microbe and is able to penetrate infected cells. The synergistic structure of anti-oxidant polyphenols, esters, flavonoids, and multiple iridoids work together to weaken disease causing organisms and interfere with the ability of a virus to assemble at the cell membrane. Olive Leaf Extract also helps to build the immune system by stimulating phagocyte production which enables immune cells to destroy microbes. Research at the Upjohn Company, published by the American Society for Microbiology, found that the active components, elenol acid and calcium elenolate, inhibited the growth of every virus, bacteria, fungi and protozoa they were tested against. (Tests on over 50 micro-organisms). Dr. Renis, one of the Upjohn scientists proved that Oleuropein could kill the Herpes virus in 1969. Subsequent research by French biologists in 1992 found that all of the Herpes viruses were inhibited or killed by extracts from Olive Leaf. They included 28 references to the anti-viral action of Oleuropein in their report. Research conducted at the Robert Lyons Clinic in Budapest, Hungary demonstrated such positive results against a range of infections that Olive Leaf Extract is now used by the Hungarian Government as an official anti-infectious disease remedy. The study included over 500 patients sufering from a variety of conditions including tonsillitis, pharyngitis, pneumonia, bronchitis, pulpitis, leukoplakia, stomatitis, herpes, bacterial skin infections and Helicobacter pylori, all responded extremely well to treatment with Olive Leaf Extract. Olive Leaf Extract's anti-viral activity has gained attention from practitioners working with CFS patients. Dr Martin, head of molecular immuno-pathology at the University of Southern California Medical Centre has discovered unusual retroviruses in a high percentage of his patients. Chronic Fatigue Syndrome (CFS) is associated with immune dysfunction, which allows infection with a variety of opportunistic micro-organisms. Research into the efficacy of using Olive Leaf Extract for Chronic Fatigue Syndrome patients is continuing and recognition of it's anti-microbial action continues to grow. Research by the Australian Centre for Complementary Medicine Education & Research (ACCMER) found that Olive Leaf Extract was lethal to human breast and prostate cancer cells in the laboratory, and a very small study in 2006 at the University of Athens, also showed that Olive Leaf Extract may have promise for cancer cases, and based upon it's general immune enhancing properties, it may well have it's place in a cancer protocol. A study from the New York University School of Medicine, New York recommended that Olive Leaf Extract be incoporated into HIV treatments after finding that it inhibits acute infection and cell-to-cell transmission of HIV-1. It was also shown to to be a useful treatment for the opportunistic infections associated with HIV. As an increasing number of positive results using Olive Leaf Extract are reported, excitement grows about its application in many infectious conditions and in people with compromised immune systems. The cardiovascular benefits of Olive Oil are of course well known, but Olive Leaf Extract itself has been shown to lower cholesterol and benefit the heart and arteries due to its powerful anti-oxidant qualities. Southern Cross University found that the anti-oxidant activity of Olive Leaf Extract, was more powerful than green tea, and vitamins C and E (ORAC value of 10,465 mmol TE/g compared to 5,937 mmol for a green tea extract). In the lates 70s, The Institute of Physiology at the Bulgarian Academy of Sciences found that the active ingredient Oleuropein, increased coronary artery blood flow, and further heart benefits were noted by Dr Victor Petkov, who found that Olive Leaf Extract normalised blood pressure. A further study by the University of Milan found that Oleuropein may play a positive role in preventing the hardening of the arteries. Extensive research shows that Olive Leaf Extract has no toxic or other adverse side effects, even in very high doses, it is a natural, non-toxic immune system builder, and a safe, highly effective food supplement with potent and proven anti-microbial action. Individuals with a high microbial load may experience a brief "Herxheimer's Reaction" (also known as die-off), for a few days as pathogens and toxins leave the body, this is a positive sign of healing as the body moves towards a state of better balance. More often than not auto-immune disorders are kept active by the immune system being in a constant war of attrition against pathogenic micro-organisms. Often, this is the common Candida infection, but in other cases may involve one or more unknown virus or bacteria. For the effective treatment of acute and chronic infection the natural microbe killers such as Olive leaf and Colloidal Silver are recommended in conjunction with Zell Immunocomplex to detoxify the dead microbes and restore the healthy functioning of the immune system.